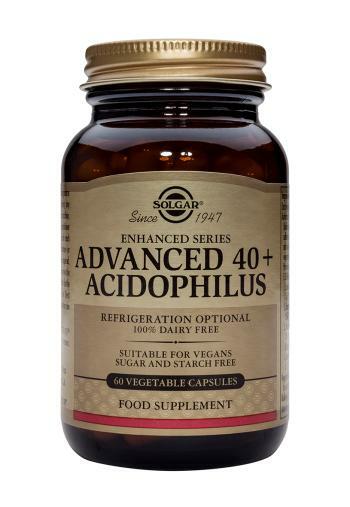 Solgar Advanced 40+ Acidophilus is a health supplement formulated to protect the stomach from unfriendly bacteria and acidity, helping to maintain a healthy intestinal flora. Providing L. acidophilus, L.rhamnosus GG, L. paracasei, B. lactis and S. thermophilus, beneficial microorganisms that naturally reside in the digestive tract. This product is formulated to protect these organisms from stomach acidity, helping to maintain a healthy intestinal flora. As a food supplement for adults, one(1) to two (2) vegetable capsules daily, preferably at mealtime, or as directedby a healthcare practitioner. Do not exceed directions for use. Solgar probiotic organisms are cultured on a medium containing skimmed milk powder and therefore contain traces of milk residue.